After over a month without a league win, Aylesbury United returned to form in sparkling style on Saturday when romping to a 5-0 win at Egham Town. Although recent performances have been good without necessarily getting the deserved reward, on this occasion everything clicked into place in a resounding win, their biggest of the season. It came against a very capable Egham side too and sees them up to 10th in Southern League Division One Central. Due to a kit clash, Egham had lent Aylesbury their yellow change strip, and Sarnies goalkeeper Jamie Norris continued the generosity with his part in the early opener. Jake Bewley intercepted a stray pass before moving the ball quickly for Bruno Brito. Although his effort was powerfully struck, Norris seemed to have everything behind it, yet the ball flew straight through him and into the net. 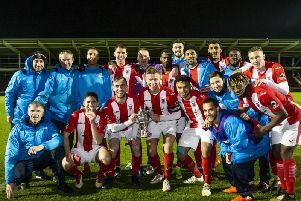 The goal had come against the early run of play, and Town threatened again when a direct ball forwards found vastly experienced former pro striker Richard Pacquette, making his Egham debut, who could only loft a shot over the bar. From that point on, proceedings were more evenly balanced, and the impressive Tre Mitford came close to doubling the Ducks’ lead midway through the half when he received a through ball, took it around Norris and had a shot hacked off the line. Three minutes later Mitford did have the ball in the net, only for the goal to be ruled out for an apparent push, while Pacquette wasted the best chance for the hosts when a quick free-kick caught Aylesbury cold and the former Queens Park Rangers man conspired to somehow scoop over when picked out unattended five yards from goal. With skipper Jack Wood unavailable, Alex Collard was drafted in for his first game of the season, and he delivered an imperious display in marshalling the defence to a clean sheet. He also came close to scoring on 28 minutes when he met a corner but his header was blocked by a defender. The Ducks made it to half-time with their lead intact, and the second-half started in much the same manner as the first, with Yorke spooning over from close range and then the misfiring Pacquette shooting tamely at Zaki Oualah. Aylesbury then took a firm grip on proceedings with three goals in a rampant 12-minute spell. Having been caught offside several times, Mitford this time sprung the trap to race clear before firing a low ball across the box and leave Sonny French with a simple close range finish. It wasn’t long before the Ducks added a third to put the game beyond doubt, with another fine example of clinical counter-attacking. Brito found French down the right, and in a role reversal of six minutes earlier, French this time squared for Mitford who nonchalantly flicked home his first Aylesbury goal. Mitford soon had his second and an Aylesbury fourth to put the well-numbered travelling fans into dreamland. A clever flick from Brito on the left flank set substitute Ollie Hogg away, and keeper Norris made a hash of dealing with his low cross, allowing Mitford to nip in and score. Aylesbury continued their utter dominance of the game with a Kinnane header cleared off the line after he was picked out by a free-kick, and it came as no surprise when a late fifth did materialise for the Ducks. As Mitford danced his way through the defence, Norris denied him his hat-trick by saving, but was unable to prevent the ball running loose where a grateful French rammed in his second. With only seconds remaining, the Ducks completed their perfect afternoon by recording successive clean sheets for the first time of the season, with their win also seeing them gain three places. The win was just what United needed ahead of this Saturday’s home game against title-chasing Farnborough.